The city of Lausanne lies in the western part of Switzerland, in very close proximity to France and Italy, in the heart of Central Europe. Located just 40 min by road or rail from Geneva, Lausanne is easy to reach by air through Geneva International Airport (50 minutes). 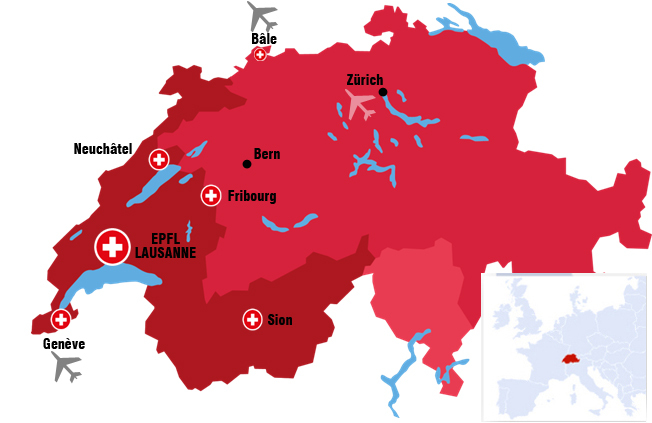 The train from Zurich International Airport takes approximately 2h30 min to Lausanne. How to reach the Swiss Tech Convention Center? By car, on the motorway, follow direction "Lausanne-Sud", exit "EPFL". Car parks: parking places (paying) for visitors are available under l'Esplanade, and along the Avenue Piccard. Car parks indicated by the green "P" symbol are reserved for holders of a special card.